Sara Singer writes in the attached BMJ editorial....."Like any management intervention, the success of an intervention like safety rounds depends on many more factors than simply closing communication loops, important though this may be. The findings of Sexton and colleagues4 demonstrate a strong and almost certainly real association between feedback and the organisational impact of safety rounds. But, rather than constituting a magic bullet, feedback probably combines with organisational attitudes, infrastructure and social and contextual awareness to constitute the ‘secret sauce’ for successfully implementing management interventions like safety rounds." Using the SCORE survey instrument authors Sexton et al conducted a cross-sectional survey study to evaluate associations between receiving feedback about actions taken as a result of WalkRounds (WR) and healthcare worker assessments of patient safety culture, employee engagement, burnout and work-life balance, across 829 work settings. Work settings reporting more WR with feedback had substantially higher safety culture domain scores (first vs fourth quartile Cohen’s d range: 0.34–0.84; % increase range: 15–27) and significantly higher engagement scores for four of its six domains (first vs fourth quartile Cohen’s d range: 0.02–0.76; % increase range: 0.48–0.70). Conclusion This WR study of patient safety and organisational outcomes tested relationships with a comprehensive set of safety culture and engagement metrics in the largest sample of hospitals and respondents to date. Beyond measuring simply whether WRs occur, the study examines WR with feedback, as WR being done well. The study suggests that when WRs are conducted, acted on, and the results are fed back to those involved, the work setting is a better place to deliver and receive care as assessed across a broad range of metrics, including teamwork, safety, leadership, growth opportunities, participation in decision-making and the emotional exhaustion component of burnout. Whether WR with feedback is a manifestation of better norms, or a cause of these norms, is unknown, but the link is demonstrably potent. Our 2017 publication A Framework for Safe, Reliable, and Effective Care is available for download, jointly written by S&R and IHI faculty. The concepts in this document, and the actions for change associated with them, are the underpinning of all we do at Safe and Reliable Care. We welcome your feedback and questions. For more information about the framework or to arrange Dr. Frankel to speak to your group please contact us here. Here is the PDF of our Organizational Fairness and Professionalism Algorithm. This is the product of Allan Frankel MD, Michael Leonard MD and Jo Shapiro MD. Attribution is due for the good foundational work of James Reason and David Marx. Feel free to use these materials – attribution required – and we welcome your feedback and questions. What Facilitates or Hinders Team Effectiveness in Organizations? 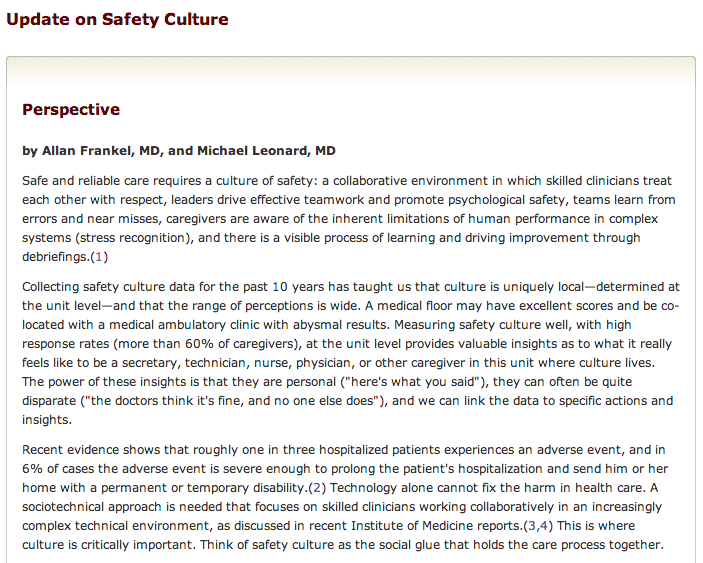 Leonard MW, Frankel AS, Knight AP in Improving Patient Safety Through Teamwork and Team Training. Salas E, Frush K. Oxford University Press, 2013, NY. Frankel AS, Leonard MW, Denham CR. Health Services Research, Vol. 41, No. 4, August 2006, p. 1690-1709. How can Leaders Influence a Safety Culture? Leonard MW, Frankel A. Patient Education and Counseling 80 (2010) 288-292. Leonard M, Graham S, Bonacum D.
Quality and Safety in Health Care 13 (suppl. 1): i85-90, 2004. Leonard M, Frankel A, Federico F, Frush K, Haraden C. IHI / Joint Commission Resources, 2013,Oakbrook terrace, IL. Healthcare organizations have an epidemic on their hands: Medical error is causing as many as 98,000 deaths a year in the nation’s hospitals. And these failures are not due to unqualified clinicians or the lack of technology-instead, evidence indicates that at least 80 percent of medical error is system derived, meaning that system flaws are setting good people up to fail. 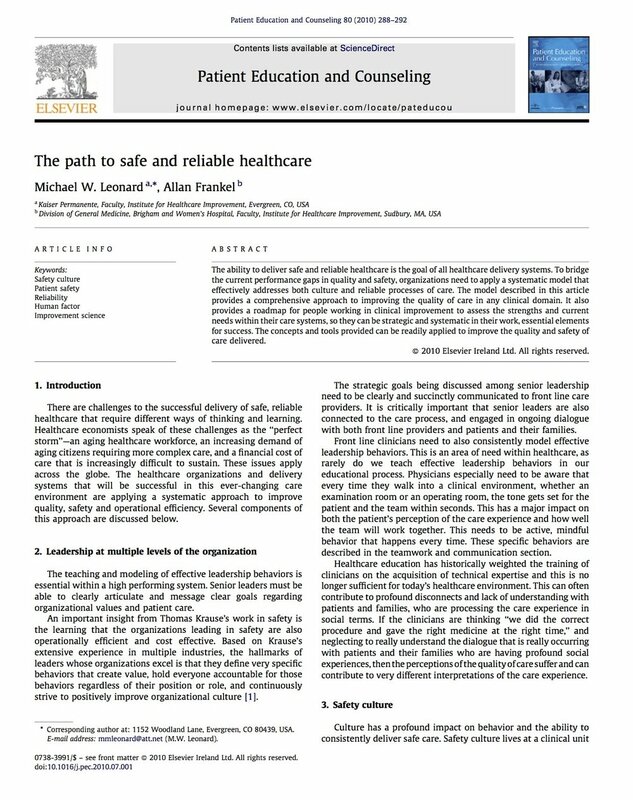 Achieving Safe and Reliable Healthcare: Strategies and Solutions provides healthcare leaders with a blueprint for building and supporting a culture of patient safety. It includes contributions from experts who have created comprehensive and successful patient safety programs in their organizations. Copyright 2019 Safe & Reliable Healthcare, LLC | All Rights Reserved. Designed by It Just Clicked.